Papers that help the forest grow. 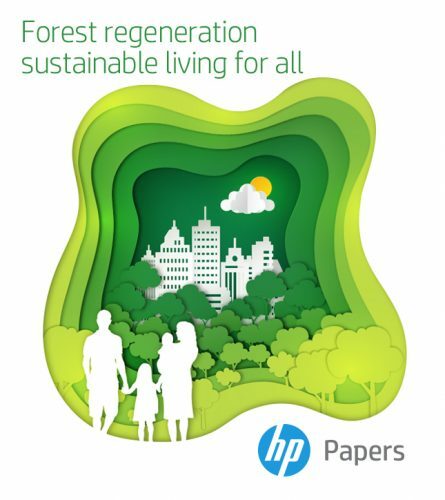 HP Papers are 100% FSC Certified. All HP North American Papers are certified to the Forest Stewardship Council® (FSC®). FSC® certification assures that the forests from which HP North American Papers are made are responsibly managed, ensuring the growth of healthy forests for future generations. We are making an impact on our air, our earth, our lives. For every HP harvested tree, three additional trees are planted. Between 2005 and 2015, forests in the U.S. grew by 13.2 million acres. According to Forest500, only 8% of companies have an overarching zero or zero-net deforestation commitment. HP, on the other hand, continues to bolster its leadership position on sustainable products among global companies. How much of our mill energy is generated from renewable biomass residuals? What percent of the HP Portfolio in North America is FSC Certified? 100%. All HP brand paper and paper-based product packaging will be derived from certified and recycled sources. For every harvested tree, how many additional ones are planted? Three. Between 2005 and 2015, forests in the U.S. grew by 13.2 million acres- an area bigger than Massachusetts combined. That amounts to over 2,700 football fields of forest growth every day! How many companies have an over-arching zero or zero-net deforestation commitment? According to Forest500, only 8% of companies have an over-arching zero or zero-net deforestation commitment. HP on the other hand, continues to bolster its leadership position on sustainable products among global companies. You can feel good about every document you print using HP Paper, knowing that generations of family tree farmers are at the heart of making sure our products are made from responsibly managed forests.